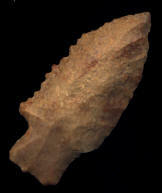 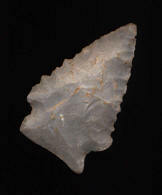 Description: Colorful Serrated Stilwell - Here is a very colorful Serrated Stilwell made from Logan County Chert. 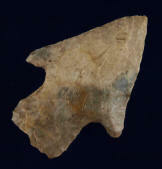 I has an anciently dinged ear but other than that has nice symmetry. 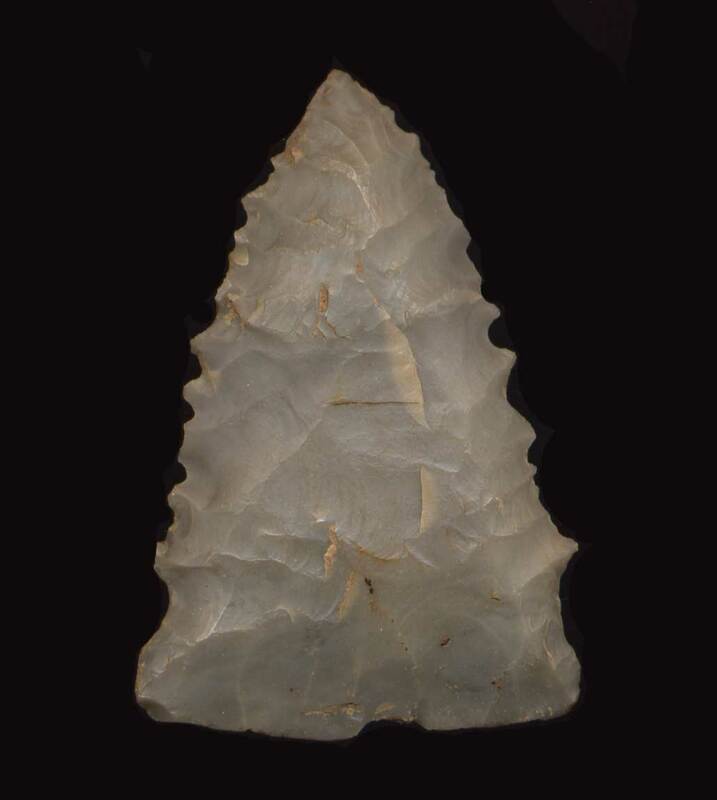 The base is classic Stilwell. This piece was reported found in Northern, Kentucky. 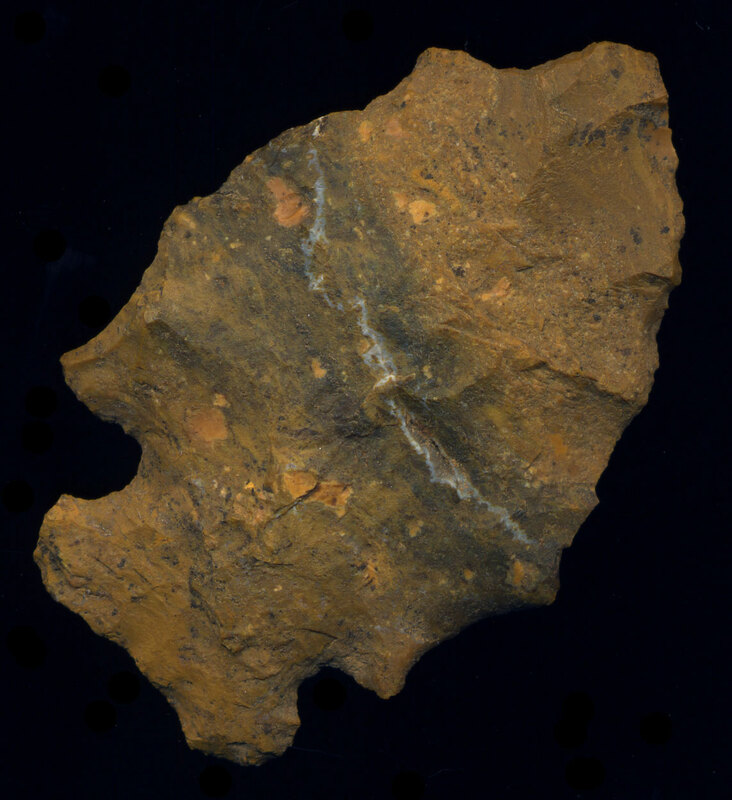 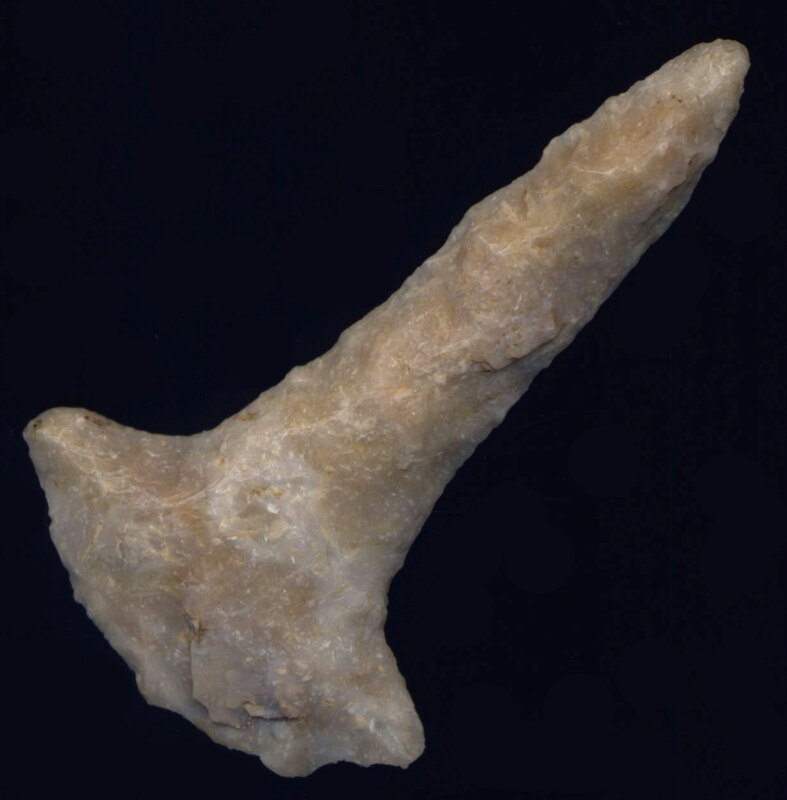 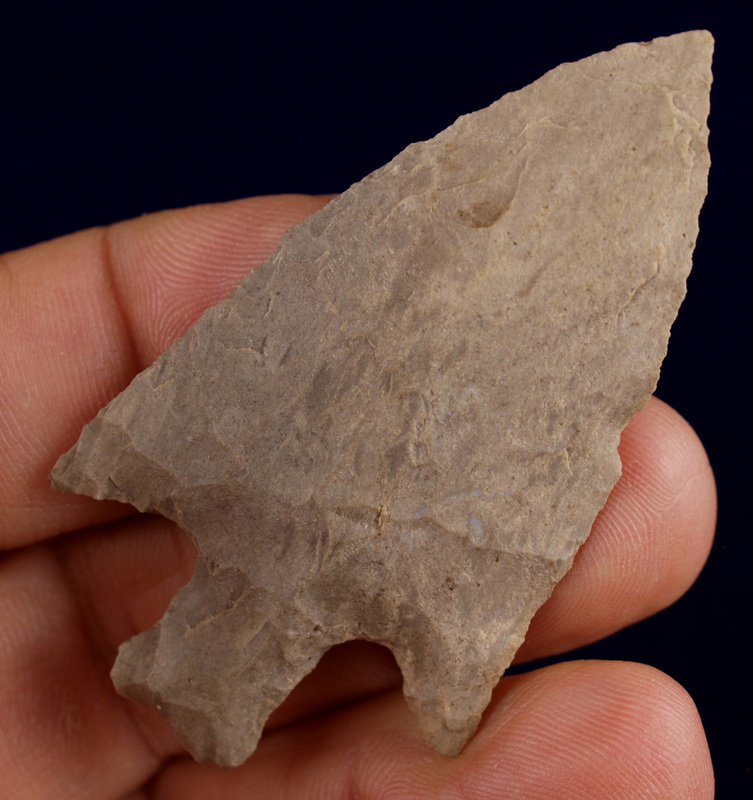 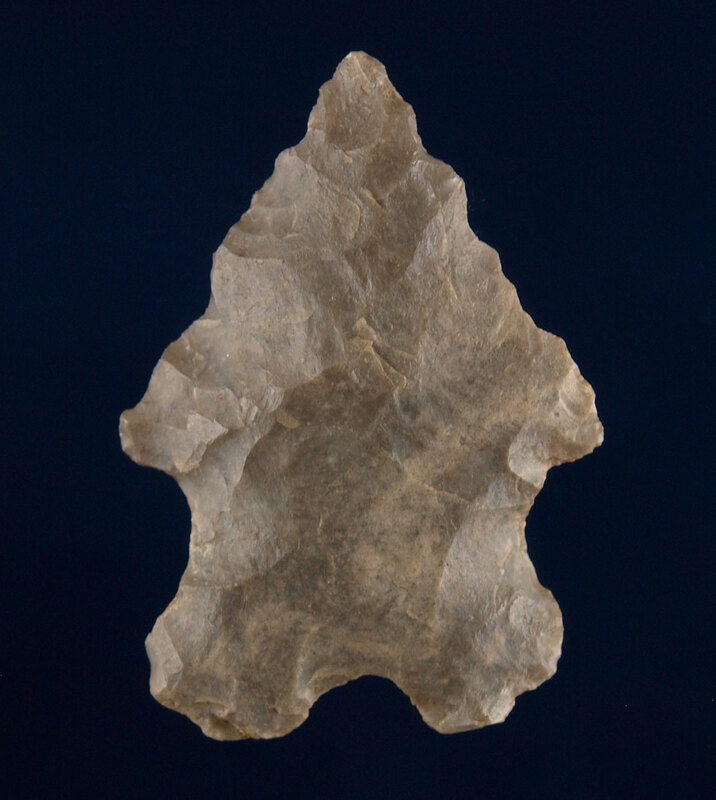 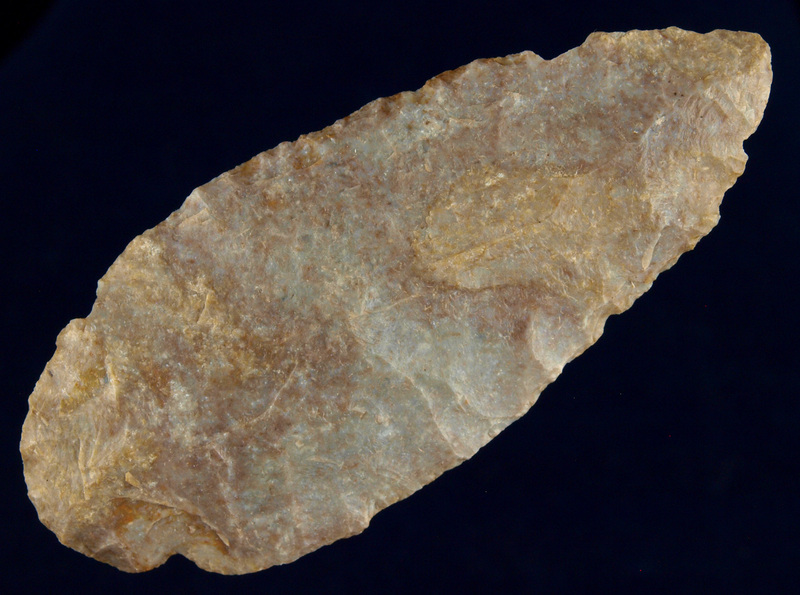 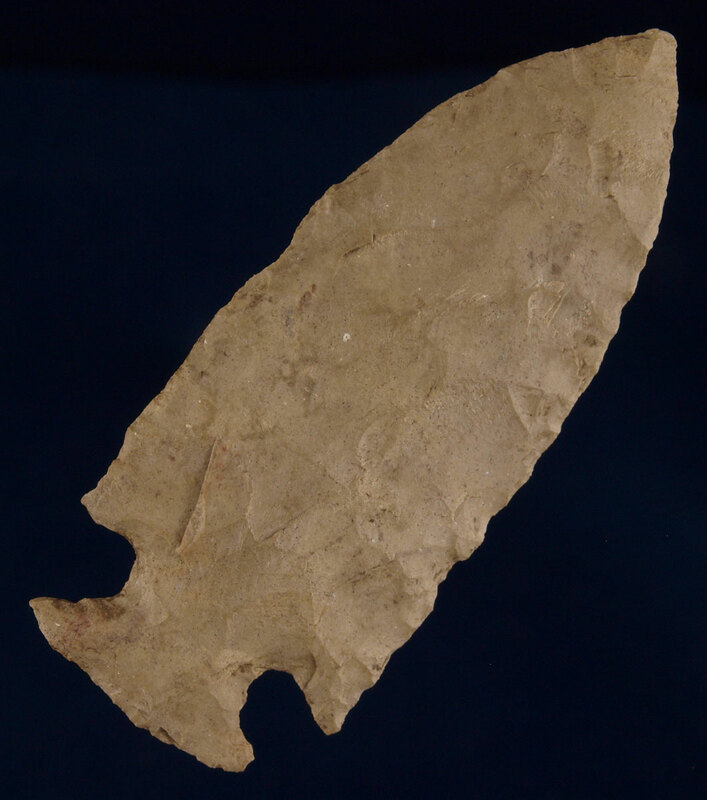 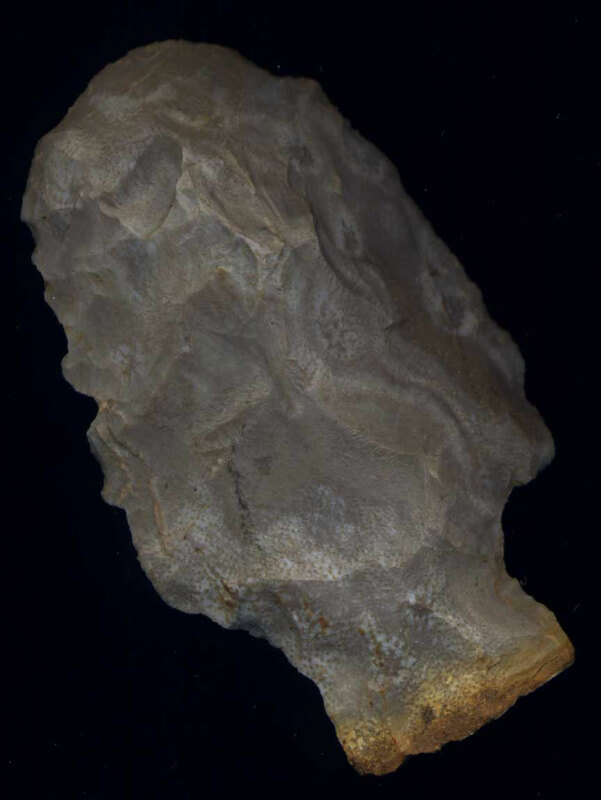 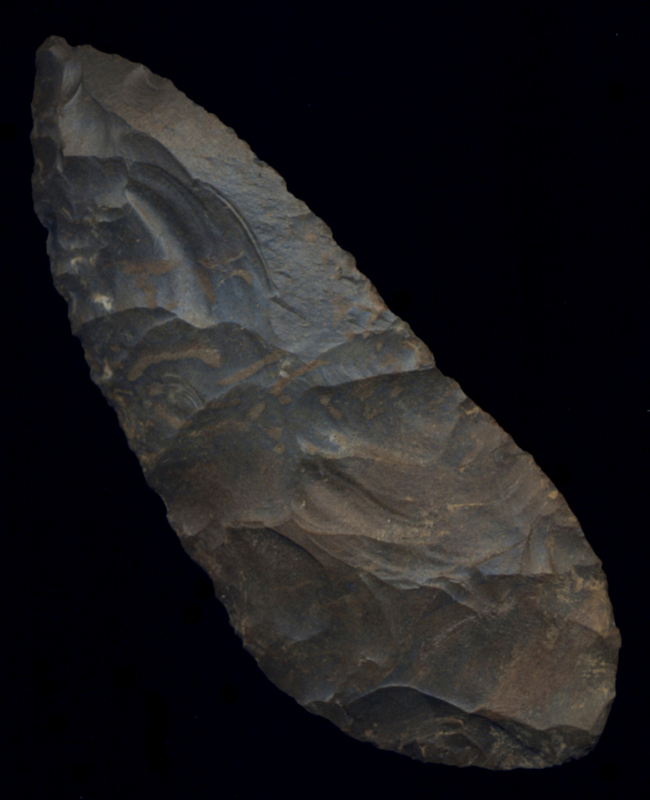 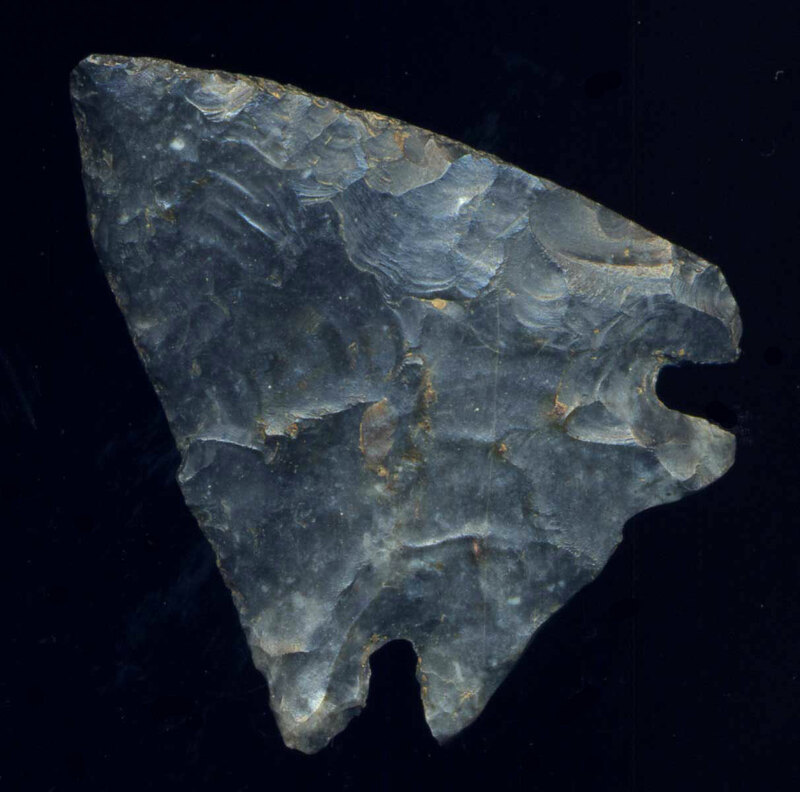 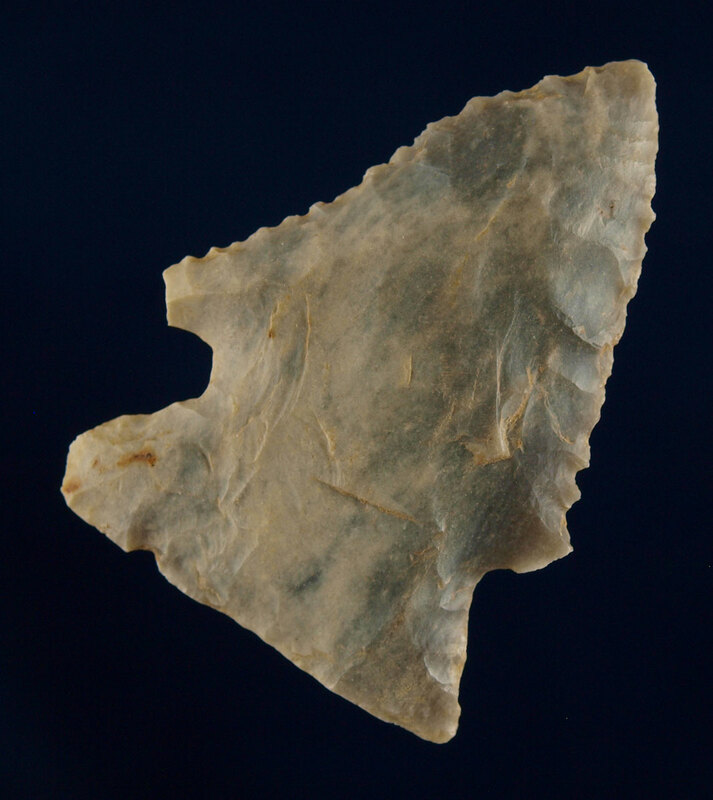 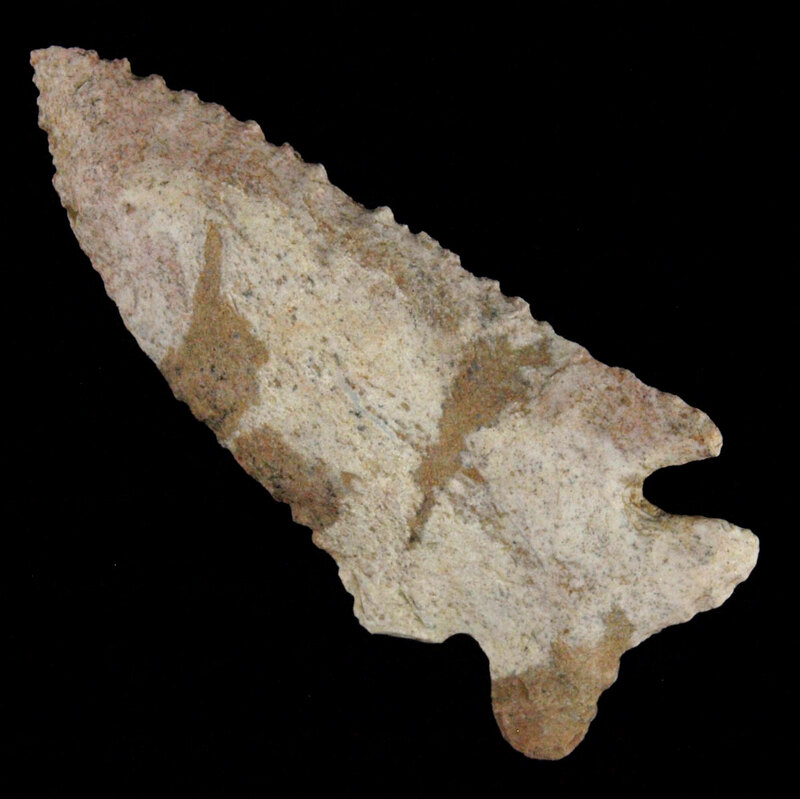 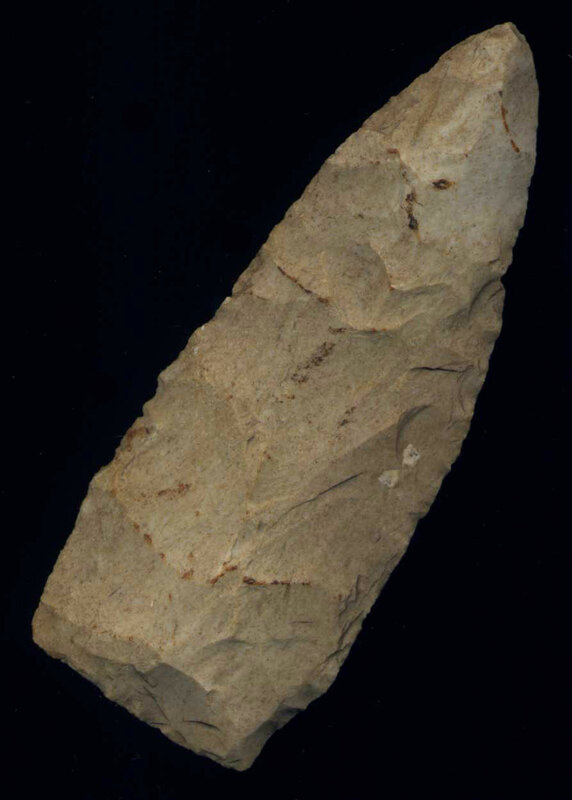 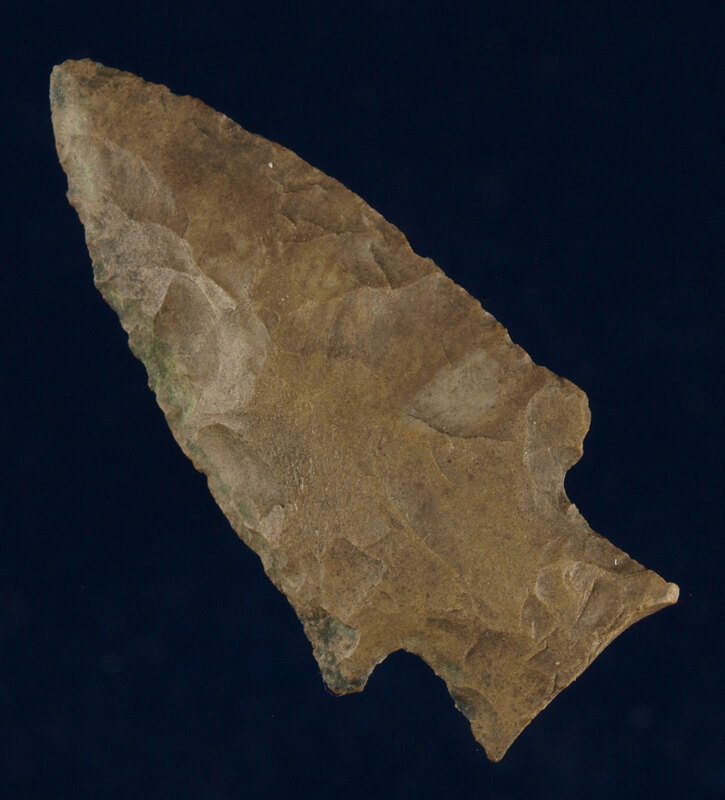 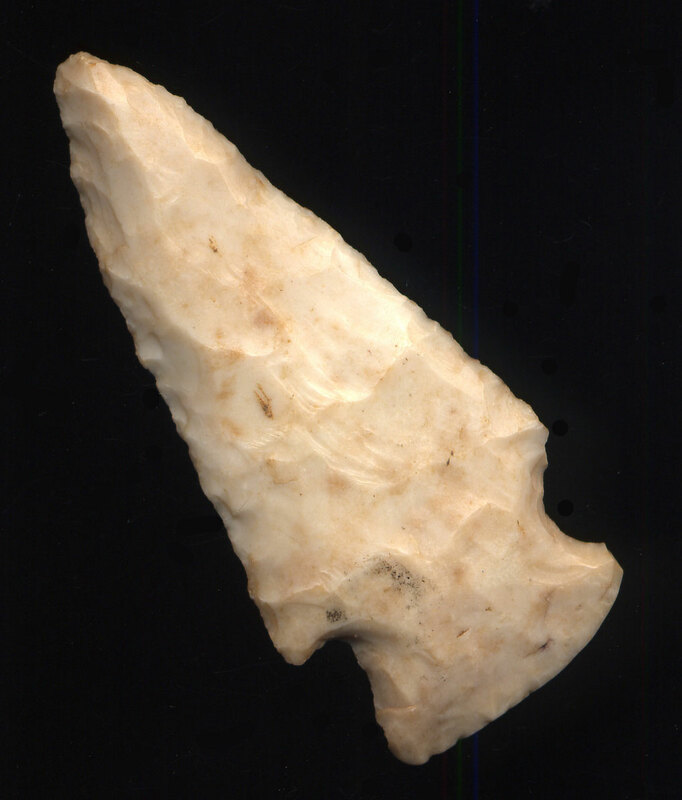 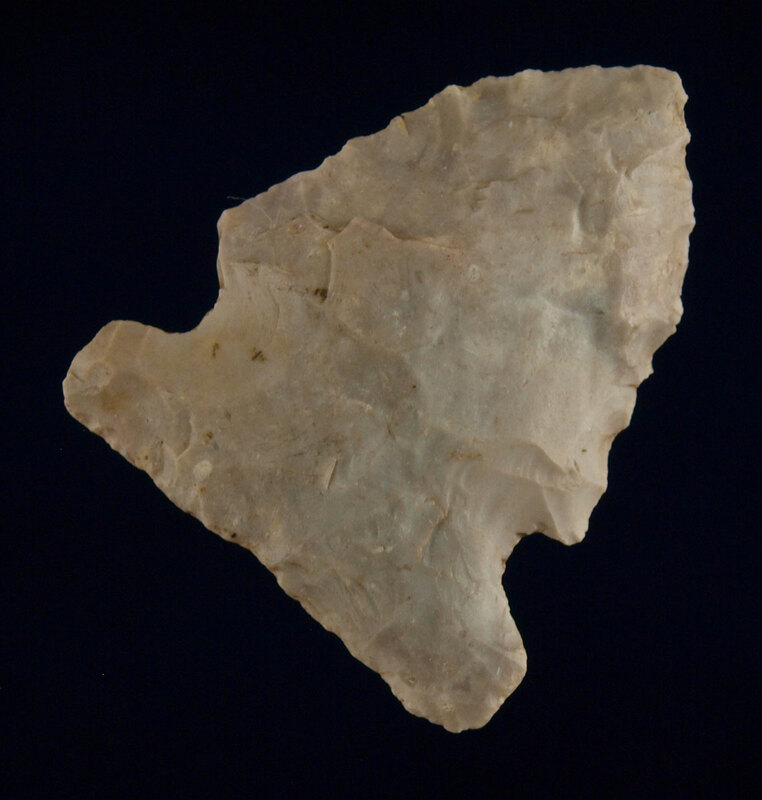 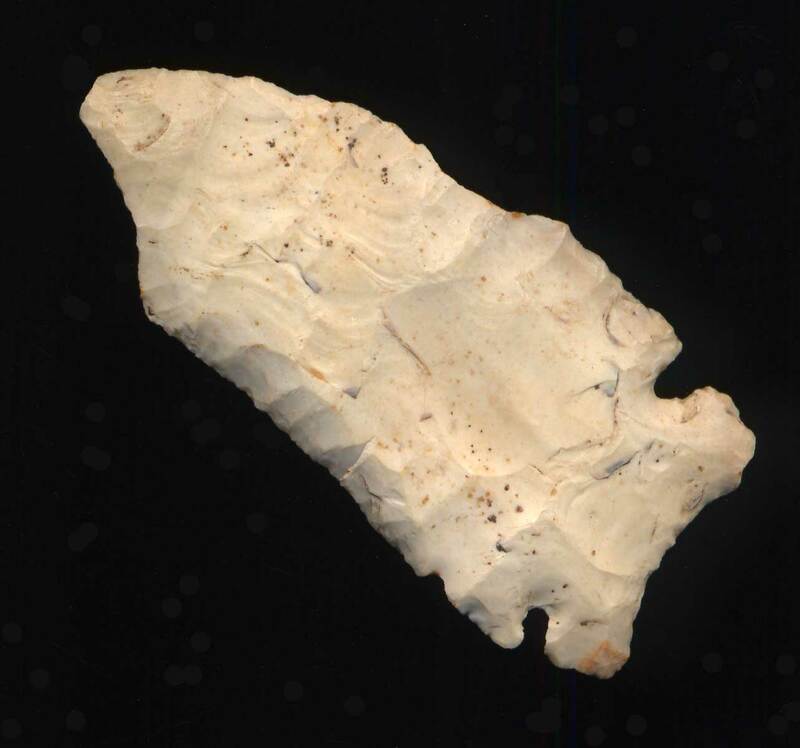 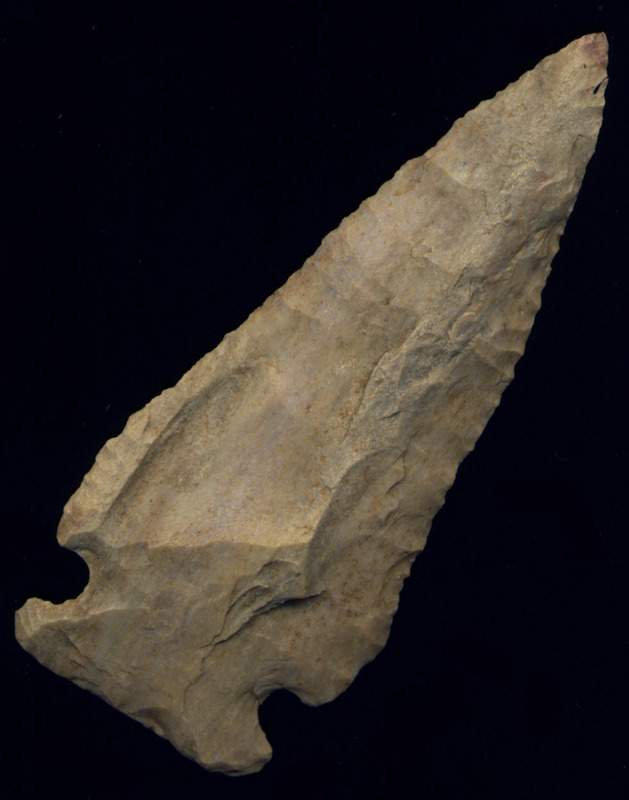 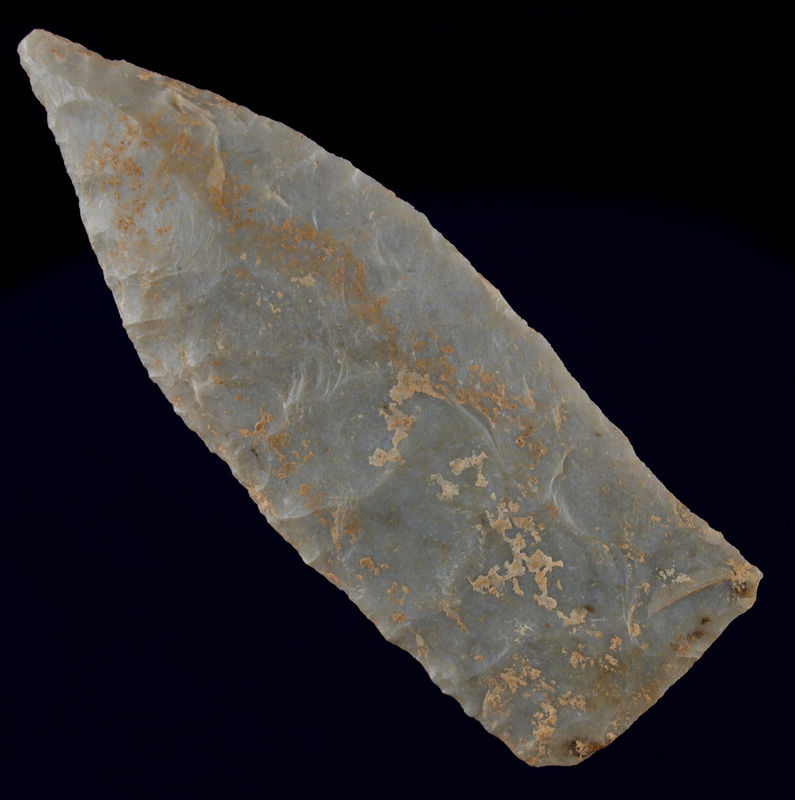 The Logan County Chert would mix well with Fort Payne. 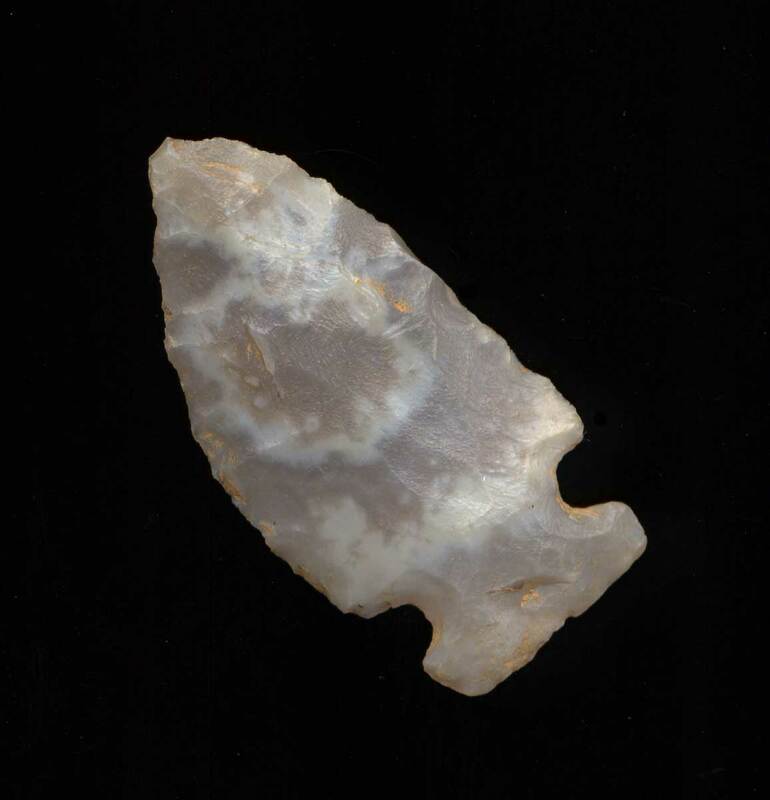 Description: Super Thin, Wide, Motley with Color - This nice Motley was found in Southern Simpson County, Kentucky in a rock shelter. It is SUPER thin and has nice color! Description: Nice and thin Motley / Buck Creek - This nice example is thin and well made. It has a nice tip and a white tail for some color. It has an ancient "burin" about 3/8" long on one blade edge. 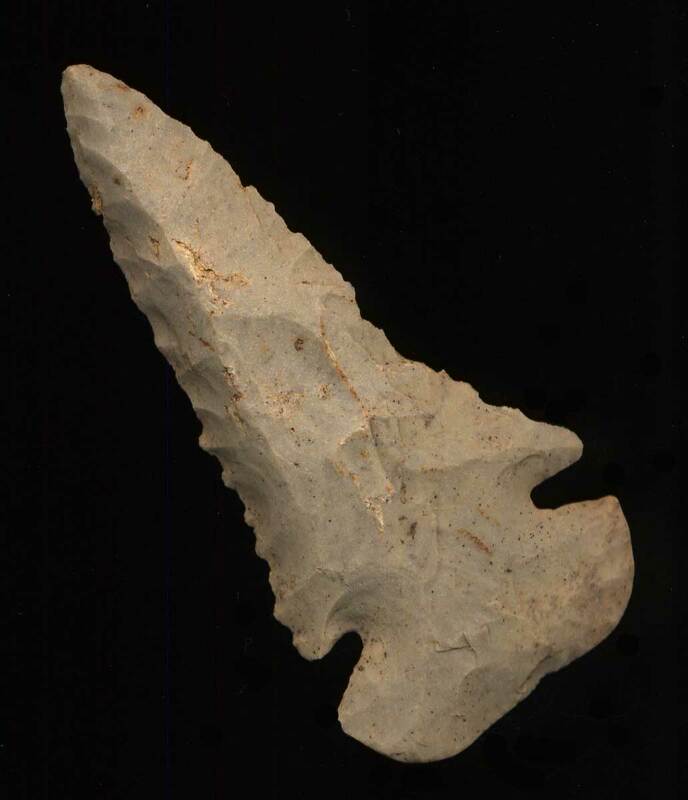 (see photos) This piece was recovered in Simpson County, Kentucky in area about the size of a pickup truck bed where also a 19 piece Cache of Motleys and Buck Creeks was found. Description: Broken and Glued Buck Creek - This one was recovered broken and has been glued back together. 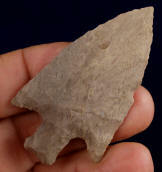 It is nice exampel of a large Buck Creek at a bargain. 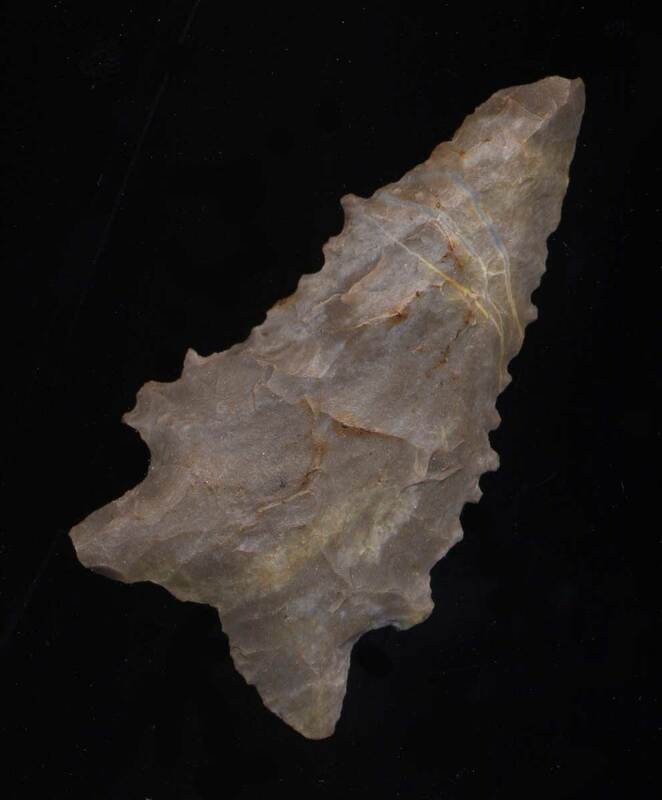 This piece was recovered in Simpson County, Kentucky in area about the size of a pickup truck bed where also a 19 piece Cache of Motleys and Buck Creeks was found. Description: Southern KY Buck Creek - This Buck Creek was recovered broken. 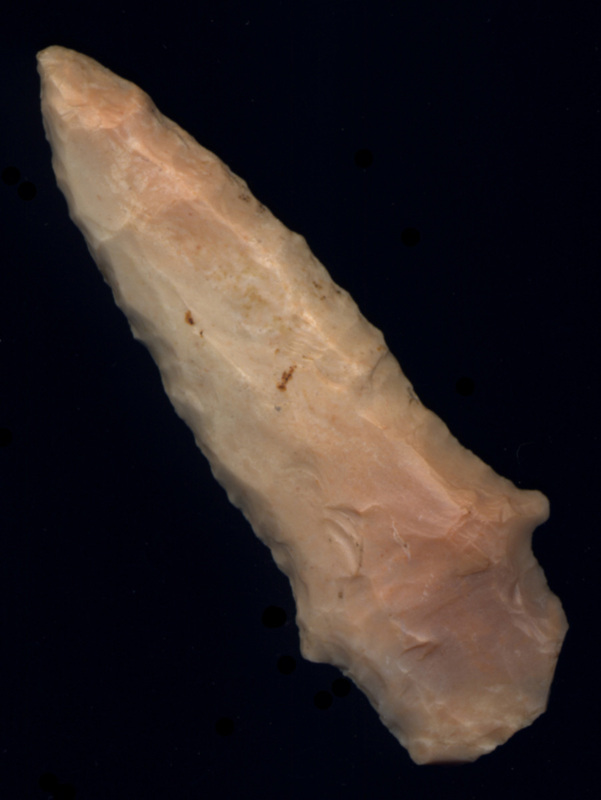 It can be glued together. It is a nice example of a large Buck Creek at a bargain. 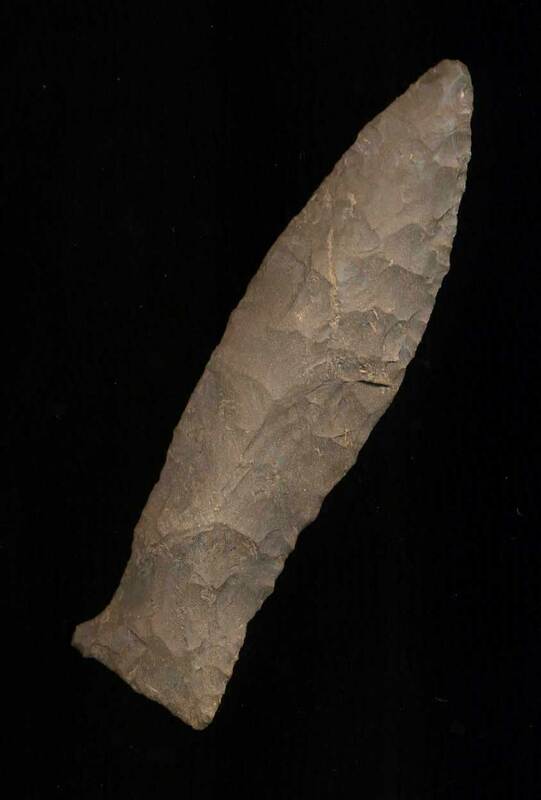 This piece was recovered in Simpson County, Kentucky in area about the size of a pickup truck bed where also a 19 piece Cache of Motleys and Buck Creeks was found. 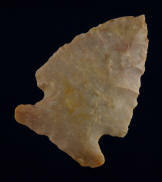 Description: Very Nice Little Coshocton Fractured Base Decatur - Nice Decatur made of Coshocton Flint. 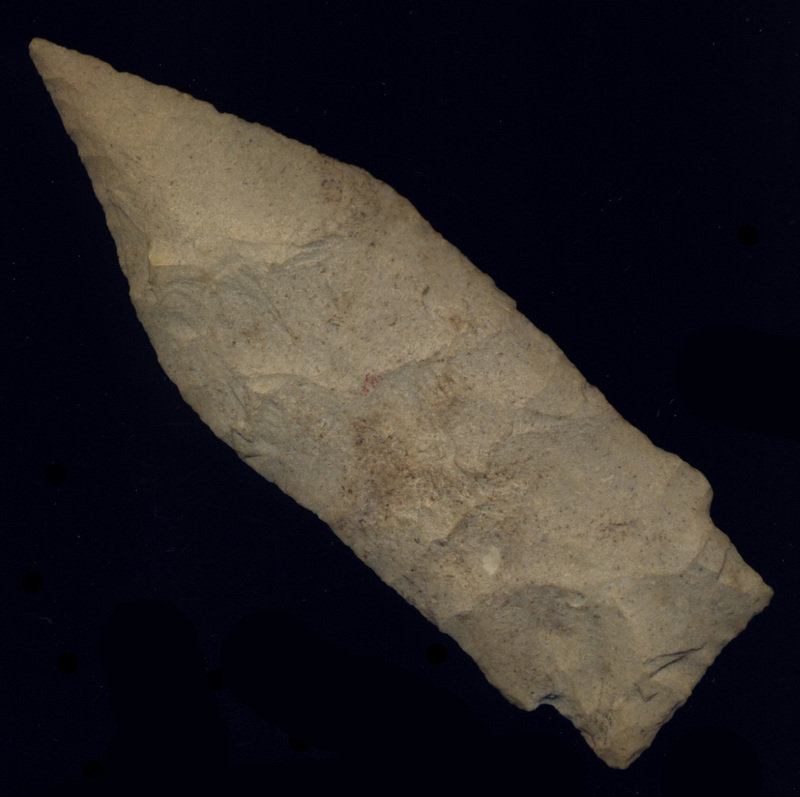 Found near Maysville, KY. Description: Colorful Side-notch from - from a North Carolina Collection. 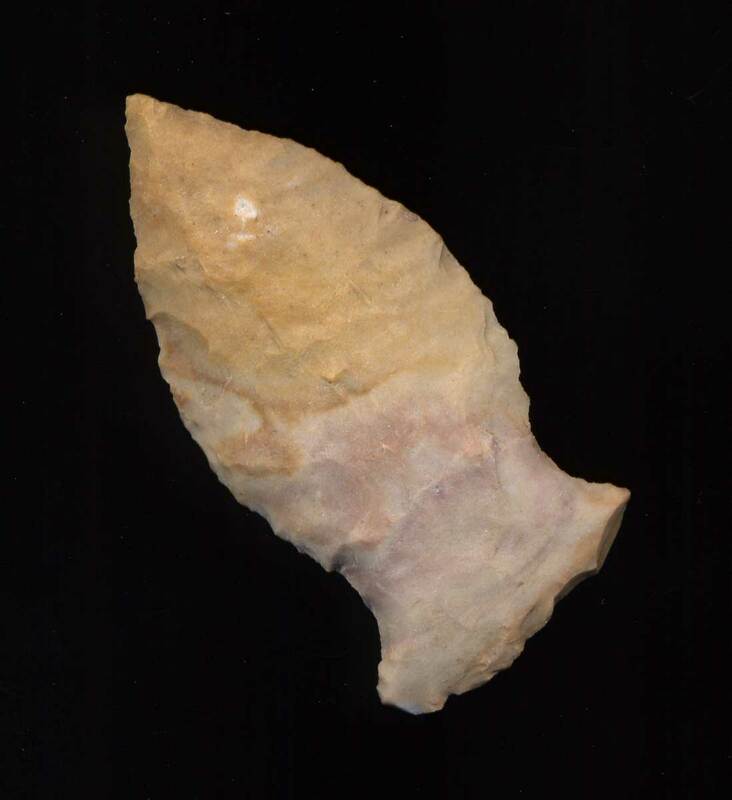 Description: Nicely Swirled Tyrone Chert (aka Crab Orchard) Stemmed Hafted Scraper or multi-purpose knife - Found in Boyle County, KY. Description: Beautifully shaped Buck Creek - This Nice Buck Creek is made of Highly patinated striped Dover Chert. It has a very nice tip and expanding blade edges that terminate into nice barbed ears. 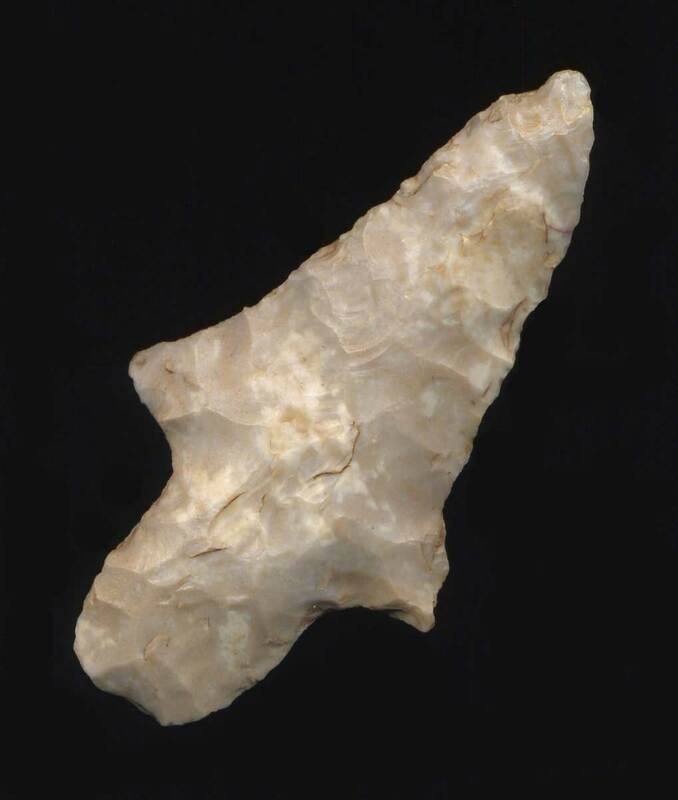 This Buck Creek has excellent symmetry and form. It was found in Simpson County, Kentucky. Description: Serrated Hornstone Pinetree - Perfect Symmetry, Serrated, nicely flaked! Description: Thin and well made Motley Variant - This nice example is THIN and well made. It has nice flaking and symmetry. It is probably highly patinated Hornstone. 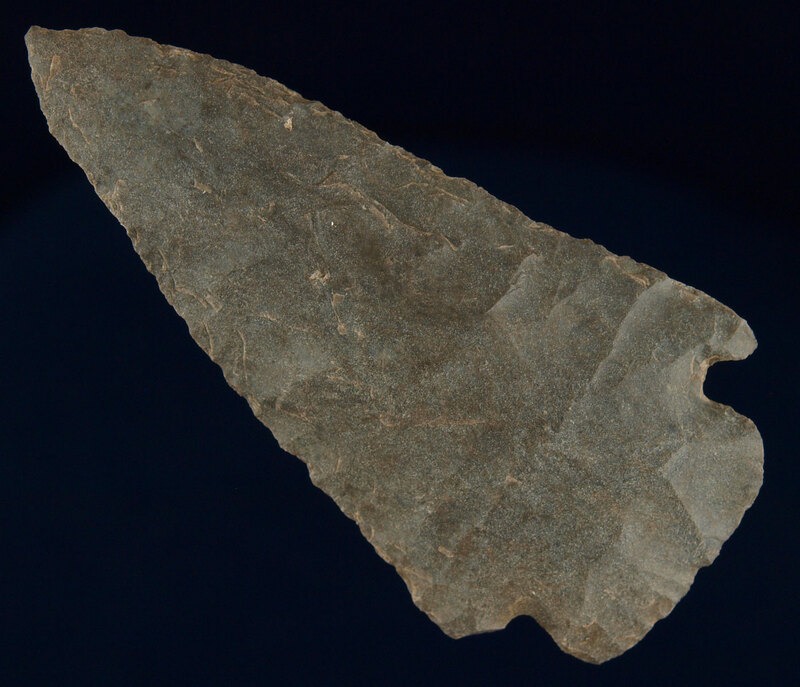 Found in Simpson County, KY. A DEAL for the price! 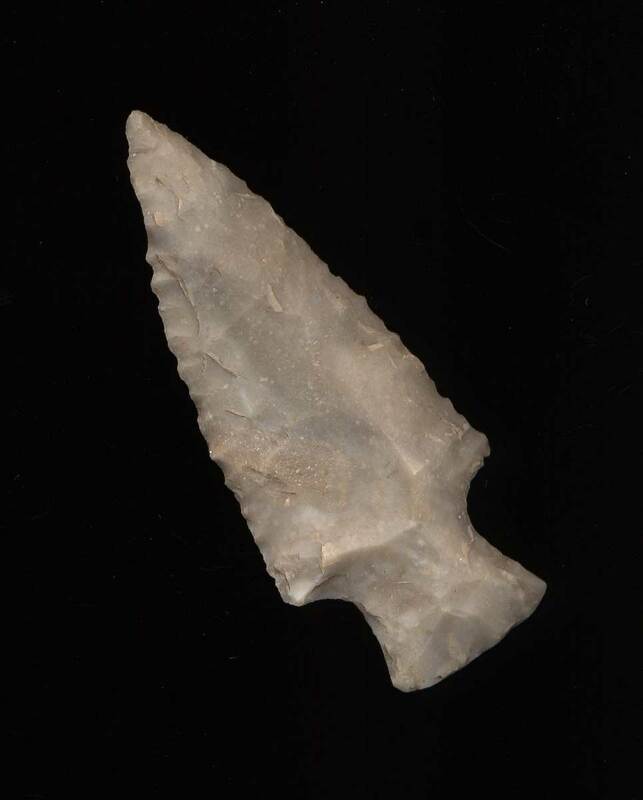 Description: Sonora Chert Serrated MacCorkle - Made of highly collectible Sonora Chert and found in Kentucky. 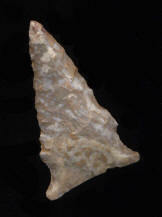 Comes with Tom Davis COA. Description: Southern Kentucky Needle Tipped Big Slough - This Big Slough was recovered in Southern Simpson County, Kentucky. 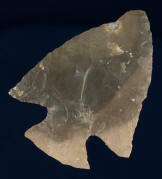 It has a Needle Tip and very nice flaking. The base is well made and bulbous, typical of the type!